It seems like only yesterday that I started my treasury career at one of NZ’s leading treasury advisory consultants, alas it was closer to 15 years ago. “We advise clients on managing their fx and interest rate exposures”, they said. “We use derivatives such as interest rate swaps to hedge risk”, they said. “Eh?”, I thought! The financial markets have a lot of jargon but one quickly learns that many of the underlying concepts are quite simple. It is easy to assume people in the finance industry have a more in depth understanding of financial products than they actually do. There are plenty of examples of people who are exposed to interest rate swaps but whose understanding is rudimentary. Examples are young auditors who are coming across financial instruments rarely, or the back office clerk who is settling cashflows. 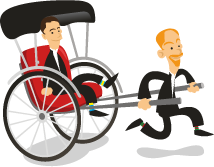 Quite frankly there are also plenty of senior people who one might reasonably expect to have a greater level of understanding of these financial products than they actually do, such as senior auditors and CFOs. In this article I attempt to explain in simple terms the purpose of an interest rate swap and how it works. Why use an interest rate swap? When I was first learning about IRSs it was explained to me that they were simply an exchange of cashflows, either fixed for floating or floating for fixed, to hedge interest rate risk. Might as well have been in French for all it meant to me at the time. So I will try and take a step back. To my mind the best way to understand an IRS is by way of an example and the easiest example is that of a borrower who wishes to fix his interest rate exposure. Many of us borrow money from the bank in the form of a mortgage for our home and we choose to lock in the certainty of the interest rate payments by way of fixing the interest rate for a few years. A pretty simple concept. The corporate borrower has a few more options available to them to achieve certainty over interest costs on borrowings. They could borrow on a fixed rate basis very much akin to our residential mortgages. Alternatively, the corporate borrower could borrow from the bank on a floating rate basis and then enter a pay fixed interest rate swap to lock in the interest rate. The outcome is the same, however, the advantage of the IRS is the flexibility it allows the borrower in regards to the term he or she can fix and the flexibility to restructure. In terms of tenor, it is common for a borrower to fix through the IRS market out to ten years or longer. It is much harder, and expensive, to get the bank to fix interest rates long term as the bank needs to be compensated for tying up capital for such an extended period of time. It is also much harder, and expensive, to break debt that has been borrowed on a fixed rate basis, however, restructuring an IRS is a straightforward process and allows the corporate borrower to take advantage of prevailing interest rate market opportunities or “play the yield curve” to use financial market parlance. 1) The company borrows money from the bank, say $1 million for our example, on a floating rate basis. There are floating rate benchmarks for different currencies i.e. BKBM in NZ, BBSW in Australia, EURIBOR in Europe, etc. and this floating rate changes/sets every day. The bank will charge a margin on the money it lends, say 2.00%. The effect for the company is it borrows money at floating rate + 2.00%. 2) The company wishes to fix his interest cost and to achieve this enters a pay fixed / receive floating IRS with a bank (maybe the same bank as it has borrowed from, but not necessarily). We will assume the company wishes to fix the entire $1 million i.e. the swap is entered for $1 million. It could just as easily decide to fix only half i.e. $500,000. Herein lies some of the flexibility an IRS allows the company when considering its interest rate risk management profile. Under the terms of the pay fixed swap the borrower will pay the bank a fixed interest rate and receive floating interest from the bank i.e. exchange of cashflows. Note, there is no exchange of principal, only interest. The floating rate received through the swap offsets the floating rate paid to the bank for the debt. The net impact to the borrower is paying a fixed rate (through the swap) plus the margin the bank charges for borrowing the money (2.00%). There are some important factors to consider when entering an IRS to ensure the hedge is at its most optimal. The roll-dates of the IRS should match that of the debt i.e. if the floating rate on the debt sets every three months then so should the floating rate on the IRS, and on the same day. The underlying reference rate on the debt and the swap should also match i.e. BKBM, BBSW, EURIBOR, etc. Both of these things ensure there is no “basis risk” within the hedge as well as ensuring it passes muster from a hedge accounting perspective if it is designated into a hedge relationship. The example above is designed to provide a basic understanding of the concept of an interest rate swap. 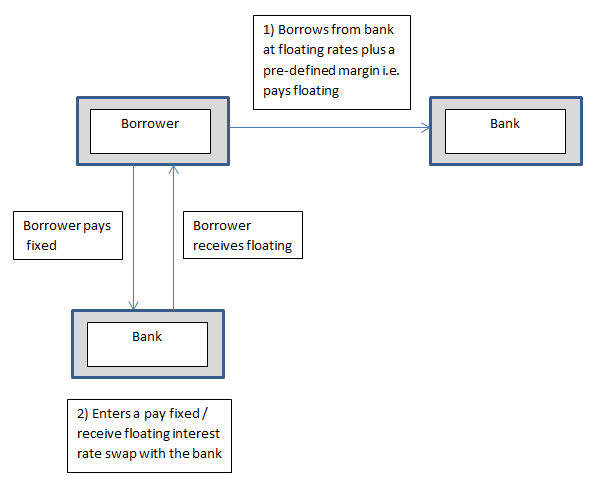 We have used the floating rate borrower as an example. However, IRSs are used by an array of market participants for a multitude of uses including investors wishing to structure their income profiles or borrowers who have borrowed on a fixed term but wish to have exposure to floating interest rates. However, the underlying concepts are fairly straightforward.